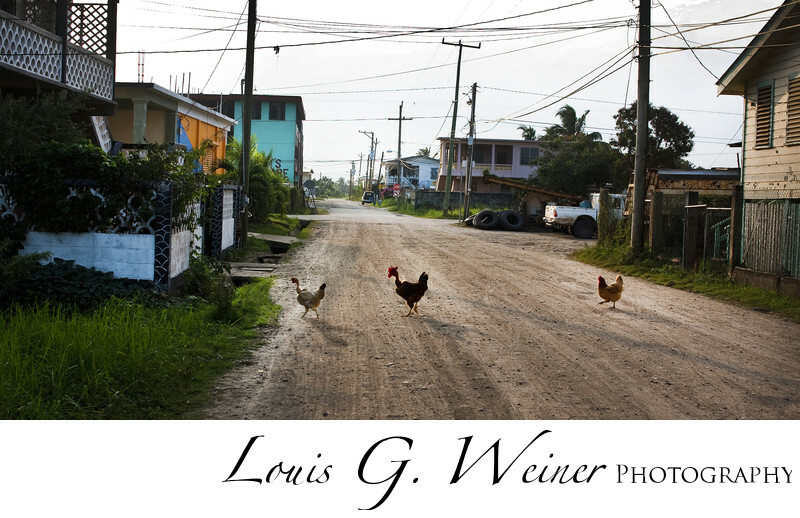 Belize Travel Photography, "Chickens crossing the road" in Dangirga, Belize. Medium sized town and boat landing for travel to Tobacco Caye in Belize. This is where I took Captain Doggie's boat, about 14 foot outboard motor. Captan Doggie was even listed in the Guide book. I only stayed one night in Dangriga, the food at the stalls was great, and like everywhere else in Belize the people were nice. I love the bright colors the people like to paint their structures. I also loved that it did not feel over populated. I was fortunate enough to spend 5 weeks in Belize a couple of years back. What an amazing country. The people where nice, traveling there was easy, the country is magnificent, the islands were fabulous. Belize is a small country (about half the size of California), small enough that I felt like I had a really good feel for the entire country in five weeks.